FORT WORTH, Texas, October 2, 2018 – BNSF Railway Company (BNSF) in collaboration with CSX Corporation (CSX), today announced it will offer a direct-rail intermodal service between Los Angeles and North Baltimore, Ohio. The domestic and international container-only service is expected to begin on October 29, 2018. The new service, which is designed to simplify customer supply chains, will run both eastbound and westbound with departure offerings five days per week in each direction. Customers who take advantage of this new service can reach key markets within the fast-growing Ohio Valley region. Much like the BNSF route from Southern California to Atlanta, a portion of this new service from the Los Angeles region to North Baltimore will operate under a haulage agreement with CSX. 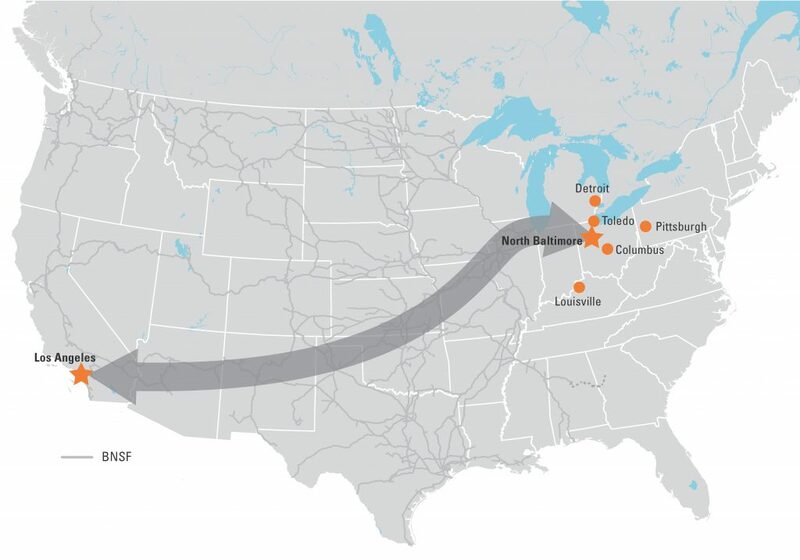 The route will traverse BNSF’s Southern Transcon through and beyond Chicago to the Ohio Valley. Manufacturing is Ohio’s largest economic sector, with export commodities shipping from the state to 213 countries. Ohio also ranks number 14 on Forbes Best States for Business list, thanks to lower business costs and an improved economy.